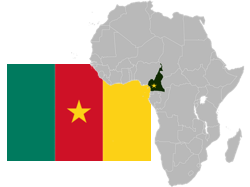 The dialects of French and English that are spoken in Yaoundé are very different than the versions of those languages that I speak and understand most easily. In fact, it is easier for me to communicate with locals here in French than in English. But, most conversations are navigated very freely and the language employed depends on both parties and their comfort and ability. Our work environment uses a wide mixture of English and French as well as translators for both. There are Americans, Canadians, British, and Australians who are all native speakers of different English dialects. In addition to the many Africans, there are also Koreans, Dutch, Germans, Swiss, Hungarians, and Swedes who speak English as a second language. And of course there are native French speakers from Canada, France, Switzerland and various African countries. Then, there are all those who speak French as a second or third language. The potential of miscommunication abounds as does the need to be flexible. 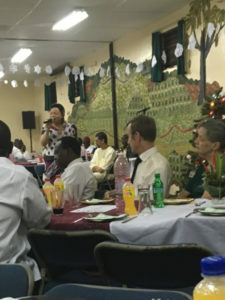 The MCs for the branch Christmas baquet included an Anglophone (English-speaking) Cameroonian woman and an American man. The American was the French MC for the evening while another Francophone (French-speaking) Cameroonian woman translated other English-speakers words into French during the event. Unfortunately or fortunately for the translator, most of the crowd is fluent in both of these languages and corrected every mistake she made and helped her out when she struggled. Every spring around Easter our missionary community gathers together for worship, spiritual emphasis meetings, and business meetings. With everyone in meetings there is a huge need for childcare during that time. If you or or others from your church are interested in helping with this need please contact us or Lori Chilton at hr-staffcare_cameroon@sil.org. Please pray with us that God will lead the people he has chosen to care of all our young ones during that time.